Not all investors are a-Twitter about Thursday's big initial public offering. Twitter (TWTR) shares hit the ground running, surging to a high of $50 a share before pulling back to end the day at $44.90. The social media company priced its IPO late Wednesday at $26 a share. But the chatter on StockTwits, a Twitter-like service for investors and day traders, was less than flattering at best, and downright vicious at worst. 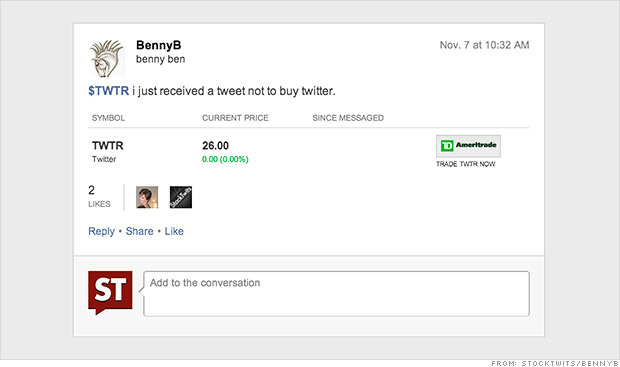 Of course, the irony of using tweets to trash Twitter's IPO did not go unnoticed. There was a also game of 'what I use more than Twitter' going on. Some traders were already talking about shorting Twitter. Why all the hate for Twitter? The biggest complaint was that the stock is simply overpriced for a company that has yet to turn a profit. Another common gripe was that small investors are getting fleeced by the big banks that bought Twitter shares at a lower price.